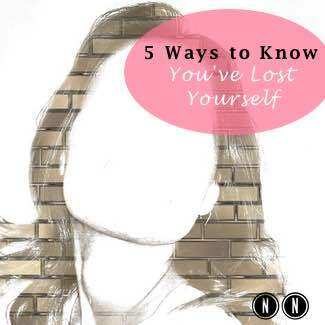 A while back, I wrote a post on the local AOL outlet Patch called “5 Ways to Know You’ve Lost Yourself” and although it was published over 2 years ago, it continues to be a popular article on their site. I think that’s because a lot of people can relate to the feeling of being lost. You feel as though you’re on autopilot most of the time. You do much more for everyone else in your life, but you tend to neglect your own needs. You don’t know what your needs even are. Or your pleasures and likes. You don’t take time for yourself on a regular basis. You don’t have any goals, or you aren’t making progress towards the goals you have. Just so you know, this feeling of having lost yourself isn’t a “bad” thing–it’s telling you something about how your life is right now. 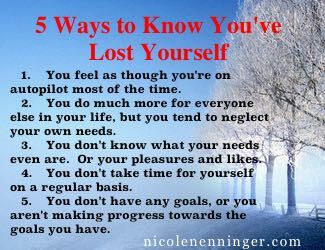 If you recognize yourself as someone who has lost themselves, use it as a catalyst to do something different. 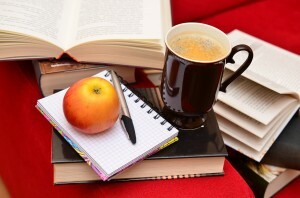 Ask yourself: What’s important to you? What do you value? Family, career, fun, love, spirituality, beauty, health, financial independence…Well, you’ve got to have food, clothing, shelter–the basics–but after that, what would make your life meaningful? How can you be more authentic and more aligned with your truth? What is holding you back from living the life of your dreams? Imagine I waved a magic wand over you while you slept, and when you woke up in the morning your life was different. Your life has now become your dream life–what your soul’s been calling you to remember. What would be different? Think of some of your role models. Keep it to 3-5 people. What is it about them that you like? Now, how do you think they spend their days? What books would they read? What are their habits? Many times in relationships, people–especially women–tend to feel they’ve lost themselves in their relationships. If you feel this describes you, you would be a great candidate for relationship coaching. Use the Contact form to schedule a time to talk about how relationship coaching can help you–and your relationship.